Beautiful View! 1 block from boat ramp. Walk to the Lake. This property is located across the street from Windsor Beach and is 1/8 mile to the boat ramp.. This home is walking distance to the famous London Bridge resort. size bed. That's 2 king and one queen sized beds! lake view, and a outside patio deck complete the a beautiful lake view and Gas BBQ. The inside also has a dishwasher, large capacity washer/dryer, 2 full baths with high quality towels. The pool/spa and clubhouse is next door to the home. It is 25 feet from the home to the pool/spa area as well as the clubhouse that has a pool table, horse shoe pits, basketball and tennis courts, and even shuffle board. This property is for those that want to be close to the ramp, and close to the bridge. This is not a party House! This is a family vacation home in great condition. If your plan is to come to Havasu to party with your friends, get drunk, get rowdy and destroy things, please call Motel 6 to secure a room. Be safe, have fun! Indoor seating area for 4. We had a wonderful stay. This home is close to everything in Havasu. The house itself is very nice and has a great view. Can't wait to stay again. Great location, nice view, extremely clean. 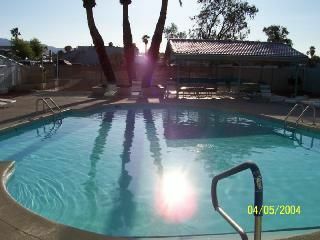 My husband noted, "one of the nicest mobile homes in Havasu!" All was perfect, except we were disappointed the hot tub at the clubhouse was not available due to repair. Stayed at Jeff's place for a week of fishing. It was as advertised, very clean and convenient. Will be happy to stay again in the future. My three sisters and I stayed at Your place in celebration of our youngest sisters 50th bday. Everything was wonderful and we had everything we needed to make our Lake Havasu visit comfortable. The house was exceptionally clean and well stocked. Beds were very comfortable. Our favorite part was being able to sit out in the mornings and evenings on the patio and enjoy the beautiful weather and views of the lake and mountain back drop. We also enjoyed sitting by the pool in the afternoons. It was very convenient to get to things also. Thank you for sharing your home with us. We stayed at Jeff's place Oct.13-16 for our family vacation. It was very clean and the beds were so comfortable. We grilled on the gas BBQ and used the kitchen often. There were plenty of towels and kitchen utensils, soap, etc....to meet our 5 person family needs. The clubhouse was nice and has a pool, hot tub, pool table and ping-pong table. We would definitely stay here again on our next Lake Havasu trip. The lake is beautiful and very close to the house along with the beaches, boat ramps, grocery stores and the London Bridge. We enjoyed sitting on the patio with the lake view. We enjoyed our stay! Very clean home and has everything you need. Well stocked kitchen for cooking. The pool is very nice and we couldn't have asked for a better location. Close to the lake and boat ramp. I'm new to VRBO so I have a few things to learn. The property was more to rent due to the holiday. Still very reasonable to rent. My reservation had to be canceled and re-booked to adjust the price for the holiday. My first trip total was only partially refunded. I have tried to get back the rest of my first deposit and I haven't been successful yet. Be careful you get your deposit back first before re-booking. Nightly Rate: $125 - $260 Weekly Rate: $875 - $1200 Monthly Rate: $1300 - $1500 ***Snowbirds*** I have additional properties available for a 4 month minimum only!!! I cannot accept 3 months rental requests. Thank you!! $125/night(during the week) $150/night weekends (Fri-Sat) $220/night for holiday weekend (3 day minimum) *****$500 refundable security deposit is required on all rentals***** *****$750 refundable security deposit on all Holiday Weekends****** ****$95 cash for cleaning to be left after any rental. If cleaning fee is not left, $125 will be deducted from your deposit******** *********All Credit Cards Accepted and preferred via Paypal********** These figures and date calendar are accurate. Please review them before emailing! !